Yes, it still could be, as that line has stood the test of time from my WHL preseason predictions, which had Prince Albert advancing to the Eastern Conference final before falling to Lethbridge. That scenario remains plausible, if not probable. My Western Conference final prediction of Spokane over Vancouver, with Spokane going on to defeat Lethbridge for the Ed Chynoweth Cup could also come to fruition but seems a bit less promising in hindsight. Prince Albert is now the team to beat — based on winning the Scotty Munro Memorial Trophy as regular-season champs and having topped the CHL rankings for much of the campaign — but Lethbridge, Vancouver and Everett are legitimate contenders. The Edmonton Oil Kings, as the other division winner ahead of Lethbridge in the Central, have earned the right to be taken seriously too. Spokane and Portland are facing off in the first round, with both having the potential to go on a run if Spokane gets quality goaltending and if Portland gets Cody Glass back. The other marquee first-round matchup is pitting Saskatoon against Moose Jaw, with that winner capable of pushing Prince Albert in the second round. As of today, I’m predicting Prince Albert-Lethbridge and Vancouver-Everett as the final four, with no huge surprises there. And I’m now going with Lethbridge-Vancouver for the Ed Chynoweth Cup, with Vancouver winning in seven. 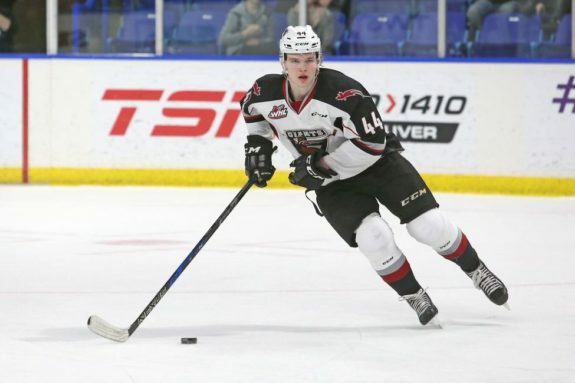 The Giants don’t have a ton of firepower, but if defence truly wins championships, then I can’t bet against Bowen Byram & Co.
Bowen Byram led all WHL defencemen with 26 goals, including a league-record six overtime winners this season, in making his case to be the top blueliner taken in the 2019 NHL Draft class as a potential top-five pick. Going back to mid-September, when my preseason predictions and power rankings were published, I raised eyebrows and drew some criticism for being high on the likes of Prince Albert, Edmonton, Saskatoon and Kamloops. The latter needed to win a tiebreaker game just to get into the playoffs, but the other three largely lived up to my hype. On the flip side, I actually had Brandon topping the East Division in the regular season via a coin flip — then losing to Prince Albert in the playoffs — but Brandon bombed down the stretch and wound up missing the postseason in a close wild-card race. I was wrong about Moose Jaw too, expecting the Warriors to rebuild after last year’s run, but they reloaded and far exceeded my expectations. Kelowna, the team I’ve covered over the years, underachieved out of the gate — going 1-9 in the opening 10 games — and couldn’t make up that ground, ultimately falling short in the tiebreaker to rival Kamloops. Victoria, on the other hand, got off to a good start and sustained it to a playoff berth in the league’s weakest division in B.C. Elsewhere, I underestimated Everett’s ability to repeat last season’s success, but I was right about the cellar-dwelling teams in Swift Current, Prince George, Regina and Kootenay (aka Winnipeg). I was also bang on about the U.S. and Central Divisions sweeping both wild-card spots in their respective conferences, nailing all four in Tri-City and Seattle in the Western Conference and Medicine Hat and Red Deer in the Eastern Conference. Not too shabby, with 18 out of 22 predictions being right (7) or within one place of being right (11). I was two places off on three of the remaining four teams, with Brandon being three places off as my biggest miss. Could have been better, but could have been much worse, especially since some of those predictions that panned out were labelled bold back in September. Until next season . . .